Saturday, April 27, departing at 8:00am (7:30am from the subway). Cost: 390 RMB (350 RMB for members); Difficulty Level 4. In Brief: A tough Great Wall hike over tricky terrain in a remote area of northwest Beijing, with a lot of ups and downs on the way to the end. Note: this route features steep descents on loose footing—if you’re not good with heights and balancing, you will not enjoy this hike. Hiking on the 'wild' Great Wall in Yanqing District. 4–5 hours start to finish over 8.5km. Note: this route features some steep descents on loose footing—if you’re not good with heights and balancing, you will not enjoy this hike. Midway through this tough hike the wall doubles back on itself in a sharp switchback, and that’s not the only interesting feature in this section of the Great Wall. We will also see the difference in style of the embrasures produced during original construction by the different villages close by to this section of the wall, and take some steep climbs up and down the swooping stretches of the wall as it climbs and descends steep ridgelines. We’ll begin in a valley at the literal end of the road, and soon start the climbing: a steep scramble over rocks and bricks towards the first tower. After following the wall up further we’ll take a detour along the ridgeline to reach a very skinny and tall tower with no obvious point of entry. From there we’ll inch down a narrow and difficult trail, before heading up again along a steep path to continue along the Great Wall. After more climbing up and down we’ll get to the repaired ‘switchback’ part of the wall, and continue a little further before stopping for a quick lunch break at the highest point on the walk. From the lunch spot we’ll continue to follow the wall, making some extended descents and ascents, and one off-wall detour, as we head for a more accessible stretch of this section of the Great Wall. After a steep stair climb we’ll reach the “General’s Tower”, one of the biggest towers in the area, and likely the location of the commander in the area back in the Ming Dynasty. From here we’ll be able to see why it made such a good command post – the views are amazing! From the General’s Tower the hike gets much easier, as the wall starts to follow a ridgeline instead of running up and down the sides of valleys. We’ll do some hillside detours around the steep and slippery parts until we reach the trail that will lead us back down to the village where we’ll find our bus. There are a few tricky descents on loose footing that will not be much fun if you are scared of heights. It’s quite a short hike for a Level 4, but there is a lot of climbing up and down. See 13 photos from a grey and cloudy day up on the Switchback Great Wall. Twenty-eight photos from a hot weather hike at the Switchback Great Wall. Photos from a long hike along a rough but pretty line of Great Wall in Beijing’s northwest—half recently repaired, the other half unrestored and wild. 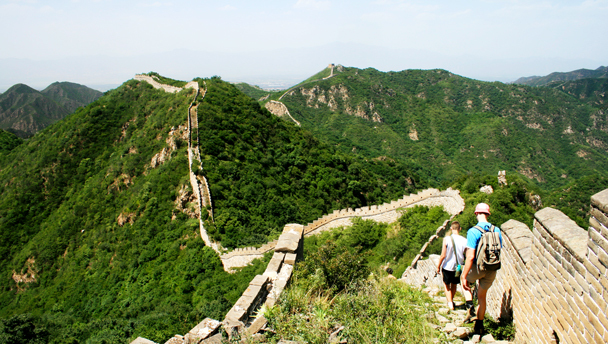 Photos from our hike along the Switchback Great Wall, in spring! 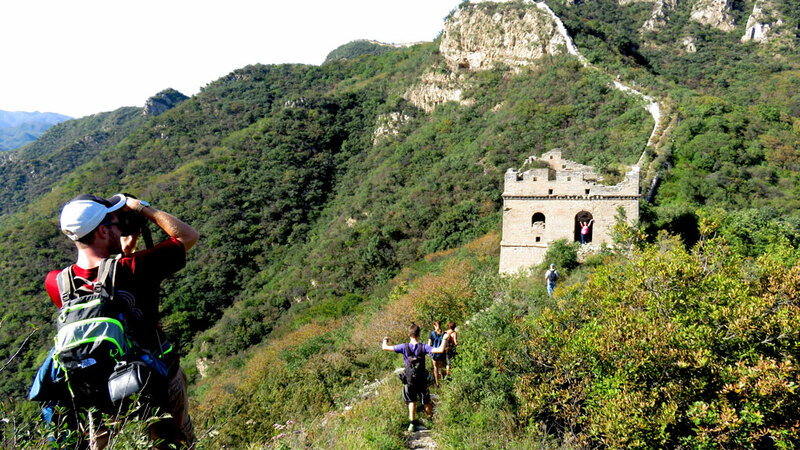 21 photos from our hike up to the Switchback Great Wall in Yanqing County. Our Switchback Great Wall hike follows an obscure stretch of unrestored Great Wall in Yanqing County. It’s a reasonably short hike, but there’s a lot of climbing to do – click through to see photos from the trail. After a fall of snow the day before, we were unsure if we’d be able to do this hike. Our local contacts said all was ok, so we headed out for a day of tricky hiking on the Great Wall in the snow. Click through to see photos of the wall and hikers in the snow. In February we did several hikes in the snow - click through to see stats and a few photos from our February 6 visit to the Switchback Great Wall.